This soup is like culinary alchemy: creating gold from virtually nothing. It’s amazing how much flavour you can coax out of an onion with patience. Taking the time to slowly brown an onion is one of the most satisfying things you can do in the kitchen. It’s the key to the rich, deep flavour in a bowl of true onion soup. 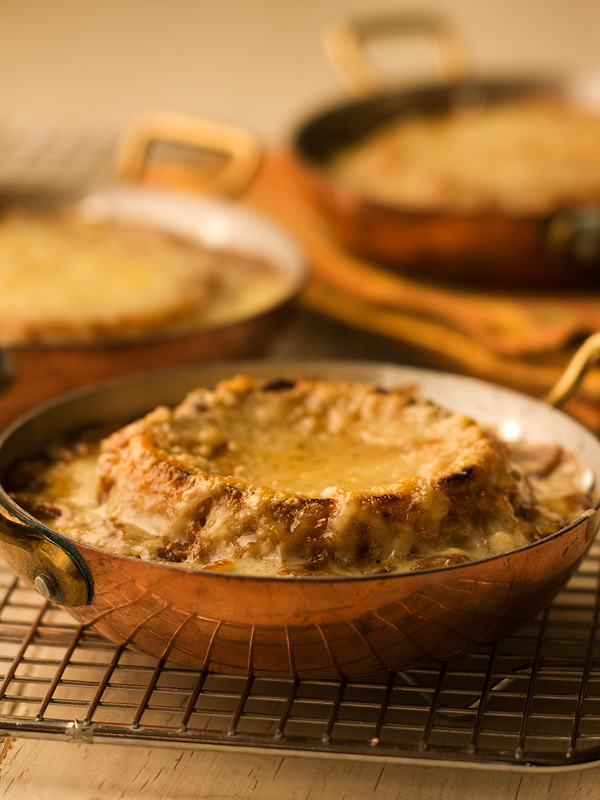 For the caramelized onions, toss the butter and oil into in a large heavy stockpot set over medium-high heat. Melt the butterthe oil will protect the butter and its flavour from burningand then add the onions, a splash of water and salt and pepper. Stir well, then cover with a tight-fitting lid. This will capture steam and help the onions release all their moisture. Cook, stirring now and then, until the onions soften and become quite wet, about 10 minutes. Remove the lid and continue cooking over medium-high heat, stirring frequently until all the water has evaporated. Lower the heat a bit and slowly begin to caramelize the onions, stirring them frequently. This will take about 1 hour. You don’t need to stir continuously, just enough to keep the onions from sticking to the bottom. Continuing to lower the heat will also help prevent sticking. For the soup, when the onions are a deep golden colour and have shrunk dramatically, add the brandy. Turn up the heat and cook for a few minutes, stirring constantly, until the additional liquid seems to have evaporated. Add the chicken broth and bring to a simmer. Add the thyme leaves, season with salt and pepper and continue cooking for 15 minutes or so. To serve, preheat the broiler in your oven. Toast the bread slices to add flavour and help absorb the soup. Cut rounds out of the toast, large enough to fit your soup bowls. Ladle the soup into 4 ovenproof serving bowls. Top each with a slice or two of toasted bread rounds, enough to cover the top of the soup. Cover the bread with an even mound of shredded cheese. Broil until the cheese has melted and browned and looks beautiful. You may use any onion to make this soup, but your best choice is simply white cooking onions. Red onions cost more and eventually lose their colour. Try stirring some sliced green onions or chives into the soup just before you ladle it into the bowls. 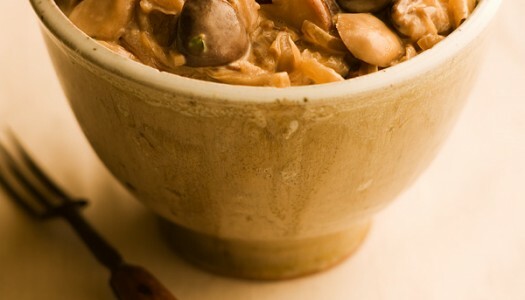 The rich meaty flavour of mushrooms make them one of the most popular side dishes in any steakhouse. This richly flavoured side dish is also perfect with a simple green salad or a freshly baked potato, or tossed with pasta. 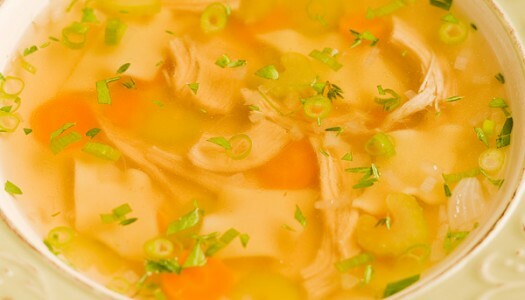 A bowl of homemade chicken noodle soup is one of the most comforting foods you can place on your table. It’s a great way to show off the hearty goodness of homemade chicken broth. It’s also a great way to show off your creativity by personalizing the flavour whichever way you want.